Yes, the marriage line is on the ulnar side of the hand. Which I read as the ability to open one self up to bonding and connecting. But, we have the family ring at the base of the thumb, on the radial side. The relationship markings on the ulnar side are more related to private and more personal interactions such as friendships and intimacy, but the radial side's markings relate to parents, siblings, extended family and people who influence ones life. Patti, as you know... there is widespread agreement in the field of hand reading that the life line and the thenar represent in respective our vitality & family. In the early years the family plays a major role in the development of a sense of individuality (which is usually associated with the thumb or index finger) and a sense of self-awareness (which is usually associated with the index finger - though some authors associate it with the middle finger). So, vitality, family, sense of individuality & sense of self-awareness are major keywords that in the early years of life play a significant role in the early development of child (it takes about 18 months before a young child has developed a basic sense of self-awareness). Then, when children gets older - after developing a sense of self-awareness, then the issue of communication becomes more important. This also explains why it takes a few years before communication related disorders (such as autism) become noticable... because this becomes manifest in the communication & interaction with other young aged children. But it requires a child to get out of the comfort zone created by the family in order to see a child's capacity to communicate & interact with non-family members in the outer world. Because communication & interaction with same aged non-family members represent the first steps of child towards to outer public world. And as you know... there is broad consensus in the field of hand reading that communication & interaction with other people gets associated with the pinky; and when children get older the communication becomes more focussed on bonding & the development of relationships (friends) with non-family members; because these represent the next steps of the child towards the outer world. I think this perspective shows that communication & relationships by it's essence themes that are much more related to how we relate to the outer/public world (represented by the ulnar side of the hand)... while family, individuality & self-awareness are themes that much more related to the inner/personal world (represented by the radial side of the hand). And one can even point out here that in the early years of life... it is actually the family (parents) that take care of the vitality of the child; and this illustrates how deep the connection between our 'inner world' (in terms of vitality + self-awareness) & our close family really is... ! So, Patti... I think your words suggest that you perceive family as being more related to the outer world, and marriage more to the personal world. But our family was already there when we were born... and in order to get married, that actually takes a loooooong journey in the outer world!!! Therefore I think that one should better avoid working with principles such as: 'family = outer world'... because the early developent of a child shows that family is actually very closely related to the inner- AND personal world of a child! After the early child years, only at a much later age communication & marriage become issues that by principle should best be associated with the outer world - because a marriage by principle takes place in the outer world, and usually it even changes our social status - by law, but often also through the family of the partner! I hope this explanation will become helpful to understand why I had to reject the 'classic' principle (where the radial side gets associated with outer world). Patti, does this make sense for you now? I agree that vitality is represented by the thenar mount, as it's among the first places to show depleted vitality. As well as all the fingertips. Then fine lines appear all over the hands. Chronic lack of vitality next shows in the dermatoglyphics, and usually at the end of the head line along the health lines on the ulnar side of the hand. Family is not "I", it is "you". 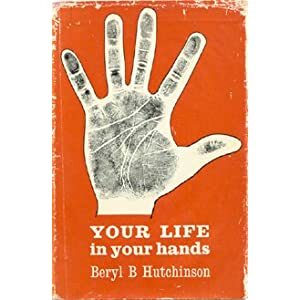 The hand is developing ulnarly and radially before birth, as you know, so describing culture and lifestyle as reasons for sides of hands to be designated as "you and I" is like comparing apples to oranges. It's probably a mistake to even try to divide the hand into "you and I" as both sides of the hands are involved in different ways with self relating to self and self relating to others. And others are always experienced through the lens of the "I" via the senses. Traditionally the index finger is about ambition, leadership and authority. Ambition usually is to 'go somewhere' in life. The drive comes from within but the action is taken outwardly. Leadership and authority relates to either taking charge of ones own direction or following the guidance of another. It relates to a person's attitude and abilities to lead or be led. Combined with the thumb and beginnings of the life and head lines, (all radial features) the strengths and weaknesses in this area relate directly to a persons efforts out in the world. Some people can lead themselves but do not care about the responsibility of leading others. The ring finger is about how comfortable a person is in their environment. It shows the reclusive homebody as well as the exhibitionist. The environment may contain other people but the ring finger relates to how comfortable self is, not "your" comfort. The little finger, also physically associated with the reproductive organs and the portion of the bottom from the hips down. Some people seem to think that humans only connect with each other at the hips. Or communicate from the lower chakras. Often in finance (also ruled by Mercury) they frequently say "it's not personal, it business". Which means they could care less about "you". A head line rising to the little finger adds to this indication. No matter where you go in the hand, you will only find "me" or "I"... never "you". The ulnar side of the I connecting with You is more personal and to benefit self, or be self expressive, and the I connecting with You radially is more relating to our kin, our tribe and to society and how best to survive among them. However, I don't expect to wake up tomorrow and see that you to have posted that you decided to agree with me, nor to see any author in your list posting to show you support, so let's just agree to disagree. Patti wrote: Family is not "I", it is "you". No Patti, you keep talking about 'I' and 'you' as independent phenomena; but I am not using those words like that at all... because I am only using those words because they make a polarity. * Family is by principle not a 'public' issue (nor a 'you' issue), because family always starts when the person is made & born in the private/intimate world of the parents (that is why family gets associated with the 'I' aspect of the polarity). - and then they become intimate (contact becomes a matter of the private world). That is why the radial key-words (vitality + family + love) traditionally get associated in the hand reading literature with the thenar of the thumb (venus), and why the ulnar key-words (communication + relationships/marriage + trade/money) get associated with the pinky. Patti, 'money' is actualy a symbol for the rather impersonal 'outer' business world. And there is wide agreement in the field of hand reading that money and trade get associated with the pinky (due to the archetype of mercurius). So far we have not talked about it much, but the 'money/trade' aspect associated with the pinky finger... could very well serve as the best example why the pinky finger by principle SHOULD best be associated with the outer world (= the 'you-side' of the hand). Because I think you are sort of putting the world upside down if you would propose that money & business can be used as symbols for the 'inner world'; because both phenomena (money & business) are based on principles that only have value in the outer world. By the way, your association regarding the word 'you' and the world of finance (you concluded: "which means they could care less about "you""), is actually an example of meaningless rethorics... because the principle of trade is always a transaction between two parties. And for a person - the 'I' - to make a trade this always requires to get in touch with a 'you': the bank, a buyer, or a seller! That is why business, money & trade are by essence all symbols for 'outer world' activities - just like the pinky finger! The hands are with no doubt extremely complex and magnificent structures. Basically however they are paws at the end of our upper limbs. Our nervous system transfers signals to and from the hands to the brain, heart, stomach and the rest of the body. The hands simply reflect the impacts of life and what we've come into the world with and acquired along the way to function in this world. A true 'definition' is usually something that can be explained in a few words, makes sense, and be profoundly understood. Polarities only sometimes work, complementary and confirming features are found just as often. Trying to assign behavioral traits to the hands so as to match with someone's world view is giving meaning where meaning isn't. We are interpreting essences of fear or no fear, comfort and discomfort, pleasure and pain, urges and desires, discipline and no discipline, and other similar human energies. Going beyond that to describe details of existence is associating things in the mind of the 'reader' to paint a picture of these essences to the 'readee'. - Starting from the observation that the three phalanges of the thumb (will - reason - feeling) represent cognitive principles that relate to our inner world. - And during this discussion it became apparent that (nearly) all commonly used principles associated with the pinky finger (such as: communication, relationships, marriage, intimacy, business/trade & money) represent principles that directly relate to the outer world. Because in the early years of life it is actually the family (parents) that take care of the health, vitality & emotional well-being of the child. And usually it takes about 18 months before the child has developed any sense of self-awareness. This is illustrative for how the inner world of the child fully depends on the role of the 'private' family (parents) during the early development! Later in life the 'private' role of the parents becomes replaced by other people, such as: other family members, friends & a partner. This explains why people often feel some kind of need to separate work (the role in the public outer world) from personal pleasure (which people usually tend to seek in their private world with partner, family & friends). And of course, social pleasure usually has a direct effect on the inner world... especially in extraverts, who generally tend to have a more developed ulnar side of the hand! The (outdated) classic principle 'radial = outer, ulnar = inner' should better be rejected permanently; because only the modern principle 'radial = inner, ulnar = outer' can continue to serve representing a consistent perspective regarding the full hand (based on commonly used themes in the field of hand reading, of course). I hope this discussion will serve as a wake-up call for many forum users, especially those who were not yet aware of the modern principle: radial = inner (family & personal), ulnar = outer (social & public). Johnny Fincham's 'From Apprentice to Pro in Twenty-Four Hours'. Martijn, Under your diagram it says "the following authors clearly support the (modern) vertical division: radial side represents inner, ulna side represents outer". and you include T.Dukes in your list. Can you give one example in Dukes work where he refers to radial side as inner, and ulna side as outer? The top chart appears to me to illustrate that family plays a role in both Social and Psychological spheres. The Social sphere includes outsiders such as people from school (principle, teachers, students), peers and family. The lower chart illustrates that the Inner World covers the whole palm (i.e. Self) and the Outer World is what is not self. In this chart it shows the 'world view', 'personal psychology', and 'values' are all Inner World things. These are things that have been described as related to the ulnar side of the hands. Except for values, which is more associated to the middle finger - which in some systems divide the two sides. These charts seem to actually disprove your stance. Lynn wrote: Martijn, Under your diagram it says "the following authors clearly support the (modern) vertical division: radial side represents inner, ulna side represents outer". In Dukes book there are various passages where he describes air in terms of the word 'external' (p.129), and he describes water in terms of the word 'internal' (see page 129). When one translates these principle to the hand, for the palm in terms of the quadrants this gives a neutral result regarding the radial-ulnar division. However, for the fingers this gives that the most ulnar located finger (air) gets associated with 'external' and the more radial located finger (water) gets associated with 'internal'. That's a first result where the 'modern' principle regarding radial vs. ulnar gets confirmed. Now, regarding the polarity inner vs outer is Dukes use of the word 'public' crucial here; because by principle that word can only be perceived as a direct reference to the 'outer world'. In Dukes work we can see that air & fire get positively associated with 'public': both air & fire are "public by intake" (+ oriented on "external conceptual sources"); earth gets negatively associated with 'public': earth is associated with "fears ... public exposure"; and finally water get more associated with "internal experiences". - and the index finger (water) is never associated with 'public' at all... however, it does get associated with processing "internal experiences". So, if one puts all the elements in Dukes work together to the fingers then one can recognize that the ulnar air + water finger are the most 'public' or 'outer' directed fingers. And this is actually confirmation of THE FACT that air & fire also represent the 2 most externalized elements in the palm (= the air + fire quadrant are more distal, more outwardly positioned than the earth + water quadrant); because air + fire represent the two upper quadrants of the palm! Finally, because earth + water represent the most internalized elements inside the palm (= the most proximal located elements)... we can also see that regarding the fingers they are located at the anatomically more inward positioned radial side of the hand. So, in Dukes work the palm is actually relatively neutral regarding the inner vs. outer polarity... but the fingers show that the pinky + ring finger are the most 'public' oriented fingers, and thus they represent the more 'outer' fingers (+ the middle + index finger represent the more 'inner' fingers). And this all gets confirmed more explicit in the work of Johnny Fincham, who's work is highly influenced by Dukes work; as Johnny started developing his career as a chirologist under the supervision of Dukes. You mean "Martijn" principle or "M" principle for short? Patti, please stop communicating such nonsense talk... because I perceive your words as a misleading attempt to suggest that I have created some kind of a new principle inside this topic, which is not the case at all. And actually, I think you were already familiar with most of the author's names & works that I have referred to. But apparently... you never studied their work properly, or maybe you have misread/misunderstood those passages in their works. Patti, I just wanted to say a big Thank You for your recent posts! All your contributions to this thread have been very enlightening to me (and I'm sure many others who have following without wanting to get into the fray), and I've been impressed by your patience and your professional attitude - rising above the personal jabs and petty nitpicking you've been faced with. Anyway, with regards to your last few posts, I can't remember ever seeing such lucid and concise descriptions before, whether on screen or in print. What a treasure! Your many years of practical experience really shine through, giving depth and credibility to your words, and integrating both scientific research and other hand readers' viewpoints into a cohesive whole. Absolutely brilliant. Thank you so much for sharing your knowledge here. I would like to echo kiwihands. Patti you said so many things in your last few posts (& in many posts in this thread!) that I agree with. I particularly like what you said in your post with the lagoon picture. Me too! The lagoon picture post was what initially made me want to express my appreciation. And once I got around to it, there was more! Lynn - Can you give one example in Dukes work where he refers to radial side as inner, and ulna side as outer? Despite your various quotes Martijn, you are unable to provide a quote where Dukes refers to radial side as inner and ulna side as outer, because there is no such quote! He refers to radial side as conscious and ulna side as subconscious. The only time Dukes uses ‘public and private’ (which could be translated as 'outer and inner') to generally delineate whole areas of the hand is palmar side = private and dorsal side = public. (edit - yes he uses 'public' for the elemental principles of air & fire, but the elements are scattered all over the palm in many different ways - remember Li & Chi - principles vs manifestations.). P 129 "Air energy is that which communicates, balances or understands experiences derived from external conceptual sources." Or I could add - an ability to communicate. Imagine if Stephen Hawking did not have his ‘voice’ via his computerised mode of communication. All that incredible active inner air (which is by far his strongest element) would never be accessible to the rest of the world, it would remain hidden in his inner world. P129 "Water energy That which identifies, personalises or relates internal experiences into emotive patterns." Yes indeed he is saying water is internal. The water quadrant is on the ulna half of the hand. Therefore he does not associate ulna half of the hand with ‘outer’. When one translates these principle to the hand, for the palm in terms of the quadrants this gives a neutral result regarding the radial-ulnar division. However, for the fingers this gives that the most ulnar located finger (air) gets associated with 'external' and the more radial located finger (water) gets associated with 'internal'.That's a first result where the 'modern' principle regarding radial vs. ulnar gets confirmed. But your ‘modern principle’ is supposed to be “representing a consistent perspective regarding the full hand “. So when you said re Dukes "the following authors clearly support the (modern) vertical division: radial side represents inner, ulna side represents outer". That’s not strictly true is it? Because by your own words you’ve said he represents the palmar quadrants as neutral. By the way, when Dukes says “Fire and air are masculine, active and public in import - yang” you have mis-translated this as fire + air = 'public by intake’ (yang). In this sentence, “in import” means ‘in importance, in significance”. You say that the word ‘public’ is crucial, but you completely ignore the fact that he also says that “air is a symbol of the world that is invisible, hidden; air consciousness resides 'behind the scenes', thought” - which are NOT public! I know you previously said you are not ignoring anything, but I see nowhere that you take this into account regarding your arguments about Dukes work. I’m not sure what ‘fear of heights’ has to do with your argument, but he also says that earth archetypes like to spend time outdoors, and that earth relates to the physical world, experiences which are manifest in the mundane world itself. So they might not like the limelight or public exposure, but they like to be ‘out there’. THE FACT that air & fire also represent the 2 most externalized elements in the palm (= the air + fire quadrant are more distal, more outwardly positioned than the earth + water quadrant); because air + fire represent the two upper quadrants of the palm! So, by your words above, Dukes more likely associates the horizontal division of upper palm with outer and the lower palm with inner (although he describes them as active and passive) rather than by the vertical division of the whole hand that you (erroneously) said he supports. 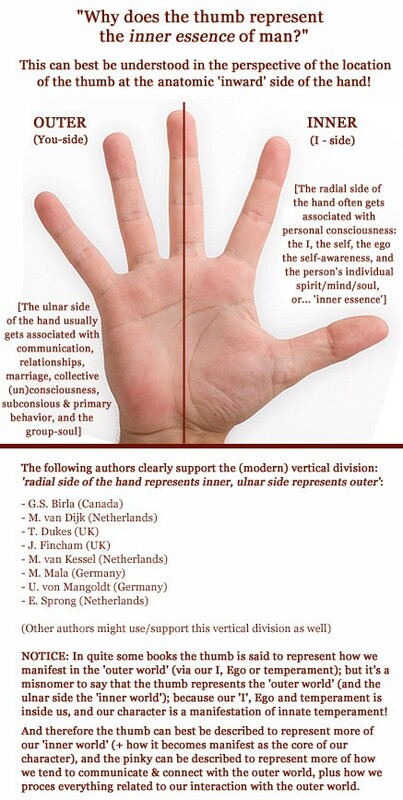 Therefore I think you should delete Dukes from your list of authors who “clearly support the (modern) vertical division: radial side represents inner, ulna side represents outer" “representing a consistent perspective regarding the full hand “. Because he clearly doesn’t support this view. Whereas Christopher Jones takes the view that the ulna side is more inner and the radial side is more outer, he also started developing his career as a chirologist under the supervision of Dukes. By the way Martijn, I don’t react well when someone tells me I “better not” do something or ‘better reject’ an idea. And regarding your comment “I hope this discussion will serve as a wake-up call for many forum users…” I almost found this offensive to all the forum users and the numerous authors who think differently to you. We don't need a wake-up call. We’re not asleep Martijn, some of us just don’t agree with you! He is not describing air as external. He says it is derived from externals. Yes Lynn, that is correct... Dukes describes air as 'derived from' externals, and this is what I refered to when I wrote the words: 'he describes air in terms of the word 'external''. But this actually proofs my point: air is oriented at the outside world, and therefore this justifies the use of the principle: 'air = outer'. And Lynn, this also explains why Johnny Fincham describes the air quadrant in terms of: 'outer world', communication, social connections, 'world stage', 'business and financial skills', and... 'mental energy'. The ‘understanding’ is internal. Yes communication is external but he says “Air consciousness is only visible to others to the extent that a choice is made to communicate” Or I could add - an ability to communicate. Lynn, as you know... the essence is that air-energy is Yang-energy, which represents outward directed energy; energy directed at the 'outer world'. And of course, regarding air we are talking about MENTAL directed energy... so of course there is also 'understanding' involved - Johnny's key-words show that as well! So, I have shown you where Dukes relates air to externals & public; and he does it in a way that is perfectly in line with the principles described by Johnny Fincham in his 3 books. Now, if you perceive the aspect of the word 'understanding' as an argument to say that air is 'inner'... then in return I must point out that your interpretation here creates a contradiction with the fact that Dukes is by fact refering in that sentence to 'external' sources. And your interpretation here also creates a clear contradiction regarding Johnny Fincham's key-word, while it is quite obvious that Dukes & Fincham are describing the same principles... they only use other words. So Lynn, even while you claim that I have failed to present you an example where Dukes is using 'radial side as inner, and ulna side as outer'... 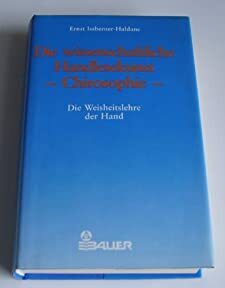 I have shown you that regarding the fingers Dukes use of the principle 'air is derived from external sources' and 'water is derived from internal experiences', applying those principles to the fingers does produce a result that is quite similar to 'radial side as inner, and ulna side as outer'. And Johnny Fincham's use of key-words (which is actually very similar to Dukes' principles) proofs it, because he has explicitely confirmed that he is using the principle 'radial side as inner, and ulna side as outer'. Imagine if Stephen Hawking did not have his ‘voice’ via his computerised mode of communication. All that incredible active inner air (which is by far his strongest element) would never be accessible to the rest of the world, it would remain hidden in his inner world. Well, that's nice. Sorry, what's your point regarding Lynn? Yes indeed he is saying water is internal. The water quadrant is on the ulna half of the hand. Of course Lynn, your words indicate that you didn't understand why I described the palm as 'neutral'? Therefore he does not associate ulna half of the hand with ‘outer’. I didn't suggest that he did. Well, yes... I fully understand your point here. But can I remind you that earlier in this discussion we have seen that it is hardly possible to identify any major-keyword for the pinky finger that can be associated directly with 'inner world'... while that finger has a huge list of themes that clearly relate to the outer world (e.g. communication, social connections, relationships, marriage, trade, business, money intimacy... and one could even argue that there is an 'outer world' aspect involved in the theme 'intimacy' as well). Now, that is what I call a clear example why it is actually QUITE IMPOSSIBLE to associate the pinky finger with the inner world... especially when one does accept the common principles used for the pinky finger in the field of hand reading! Anyway, I can understand your point regarding that we could start a discussion about where I have really managed to present a consistent perspective regarding all aspects that I have talked about. But anyway, I have shown that Dukes principles are likewise to Johnny Fincham's principles - though in the perspective of consistency, since for the palm the overall-effects are neutral... I could point out that the inconsistency regarding the upper and lower ulnar quadrant does not play a major role. Lynn wrote: You say that the word ‘public’ is crucial, but you completely ignore the fact that he also says that “air is a symbol of the world that is invisible, hidden; air consciousness resides 'behind the scenes', thought” - which are NOT public! I know you previously said you are not ignoring anything, but I see nowhere that you take this into account regarding your arguments about Dukes work. Lynn, your words suggest that you associate 'outer' with something that is visible. We have talked about 'tangability'... and obviously, air is not 'tangible'. So, what is your point really? Martijn_admin wrote: So, in Dukes work the palm is actually relatively neutral regarding the inner vs. outer polarity... but the fingers show that the pinky + ring finger are the most 'public' oriented fingers, and thus they represent the more 'outer' fingers (+ the middle + index finger represent the more 'inner' fingers). Well Lynn, looks like you are asking me to delete Dukes' work... but not Johnny's work. Sorry, so far I perceive your request/conclusion as a direct result of your (unclear) perception regarding the origins of Johnny Fincham's work; I think you have expressed that you don't understand the origins of his use of vocabulary - even though I have described by detail that Johnny's principles directly appear to origin from the work of Dukes. Maybe it would be interesting for you to start a conversation with Johnny about where he perceives any fundamental differences between his work and Dukes work. I expect that his answer will basically be a 'no' (though I am sure that he has his own personal arguments for developing his innovative vocabulary - I don't think that he has changed the principles really since he left the C.S.). Regarding the fingers the consequence of Dukes principles are very clear: ulnar finger = public (and regarding the most ulnar finger air: more derived from external sources), radial fingers = private (and regarding the most radial finger water: more derived from internal experiences). ... Anyway, I will continue to seek how I can describe things more sharply. Ah yes, I remember that you also have made those point some time ago (long before this discussion). Okay, no problem: I will follow your advice. My word choice relates to a typical Dutch expression... but I have seen it using by cops talking to traffic violators, so... 'I better not' use those words again. One more WEST-EUROPEAN author who uses the modern principle: 'radial is inner world, ulnar is outer world'! "The ball of the thumb is known to anatomists as the Thenar Eminence and to chirologists as the Mount of Venus. The area on the opposite, or percussion, side is the Hypothenar Eminence or Mount of Luna." "The area of conscious energy, closely united with physical courage, is found just above the thumb in line with the first finger. The outer or percussion side shows the degree of development of instinctive courage or fortitude." "The first two finger, half the third finger, the area of the palm beneath and part of the thumb are served by the Median nerve. This part of the hand is related to the Conscious Self, the percussion or outer side of the hand, with the little finger and the other half of the third finger, the area of the Ulna nerve, expresses the submerged or Instinctive Self and its response to the outside world." "Thumbs are usually defined as showing 'will-power', but the more correct definition is that 'Thumbs measure the power of purposeful direction'." The third, lowest phalange of the thumb is incorporated in the Mount of Venus which, we remember represents our feeling for Life. To feel alive makes one want to DO, to express oneself. Before putting any determination into action one must feel a desire to do so; the Mount of Venus, when considered as the base of the thumb, represents 'Desire'." The next step is to think how to obtain or execute that desire. This ability is gauged by the middle phalange which gives away a great deal about our habitual method of approach. When long, as long as the nail section, it suggests much time may be expended on reasoning out the modus operandi - preferably in talking about it." "The nail phalange is as ever, the flower, the performance and mirrors the power. ... The longer the phalange the more determined the Will, or the more controlled the desires." The first or index finger is an essentially human development; no other animal has this form. It stands for our awareness of Self in a world of other people." "When Jupiter is well shaped and strong the owner will have a sense of his own position, but the value may vary from an undue sense of his own importance, through ambition, to a sense of responsibility and leadership. A poor, short, weak first finger is the sign of Dr. Adler's 'Inferiority Complex'. The same effect is apparent when quite a good finger is set too low on the perpendicular arch." Thumb stands for 'the power of purposeful control' (including: 'feeling or life', 'desire', 'reasoning' and 'will'), and the index finger stands for 'our awareness of self'; and the percussion ulnar side of the hand gets connected with response to the outside world. Beryl Hutchinson - Page 23 "Your Life In Your Hands"
submerged - I guess Beryl was thinking about lagoons, too. Beryl obviously sees the ulnar side as submerged and hidden and the radial side as conscious. p.s. you confuse Bevy Jaegers with Beryl Hutchinson - funny - Fitzherbert accuses her of stealing her dg info from Beryl without credit. Perhaps you didn't understand what you were reading. "outer" is being used here as a location. I don't think Martijn that you can realistically hi-jack Hutchinson to support your view. She doesn't speak of radial as inner and ulnar as outer. "Remembering that the thumb is the primary sign of the human species, and that the grip of the thumb against fingers has given Man all the power over Nature that he possesses, the meaning of its position can be visualized readily." Power over others sounds like outer world to me. "Position on Palm. A thumb which appears to be place high on the palm, a long way from the wrist as in the monkey hands, belongs to someone with originality, It may be seen as sharing inthe thoughts shown by the fingers, but the thoughts arise from within. The opposite extreme, one which appears to start directly from the wrist itself, has to have a key of some sort to start the inspiration. A composer may hear the song of a bird, a writer builds up from some trifling incident in the newspaper, perhaps Sir Isaac Newton would have had this low set thumb from his response to the famous apple." Hutchinson is describing the position of the thumb as the difference between looking within oneself for inspiration and looking outside oneself. Here 'polarities' exist in the same feature but in its position. kiwihands wrote: Patti, I just wanted to say a big Thank You for your recent posts! All your contributions to this thread have been very enlightening to me (and I'm sure many others who have following without wanting to get into the fray), and I've been impressed by your patience and your professional attitude - rising above the personal jabs and petty nitpicking you've been faced with. Martijn (admin) wrote: Well, that's nice. Sorry, what's your point regarding Lynn? My point about Stephen Hawking was to illustrate how, in human terms, much air activity is 'inner', hidden. No, I understood. But that contradicts with your claim that Dukes "clearly support the (modern) vertical division: radial side represents inner, ulna side represents outer .......representing a consistent perspective regarding the full hand “. Because you only give evidence of Dukes supporting this for the fingers. Lynn wrote: Therefore he does not associate ulna half of the hand with ‘outer’. erm, yes you did! he is in your list of authors who "clearly support the (modern) vertical division: radial side represents inner, ulna side represents outer." Lynn wrote: “in import” means ‘in importance, in significance”. Haha... thanks for correcting that, it was rather late last night when I wrote that post. Yes, I was refering to the work of Beryl Hutchinson - as seen in the picture that I featured with my post (not Beverly Jaegers). Anyway, Hutchinson does describe the ulnar side as 'outer side' (she literally writes on page 23: "... the percussion or outer side of the hand..."), and associates it directly with (the response to) the outside world. 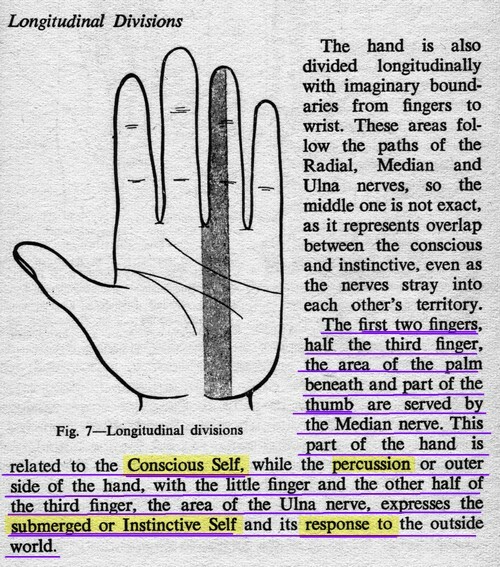 And the radial side of the hand is obviously the conscious 'self-aware' inner side of the hand. No Patti, Hutchinson is not only describing there the side of the hand as a lociation (though of course that aspect is often used as an important feature of the ulnar side!). Sprong is using a very likewise description for the ulnar mars, so I immediately recognized what Hutchinson is describing there. Self-awareness = inner world, because the words 'awareness' can by principle only relate to the inner world. PS. You mentioned 'ambition' (regarding the index finger) in one of your earlier posts... and you tried to suggest that via 'ambitious behavior' this is an outer world quality. But you are wrong here again... because ambition is by principle only "a desire for personal acheivement" (quoted from wikipedia); it's a part of our identity so it's a psychological phenomenon. And actually, the word 'personal' mentioned in this wikipedia definition show that from the fact that ambition is associated with the index finger, once can conclude that the index finger is located at the 'personal side' of the hand, the conscious 'I-side'! Even though my principle for the radial side of the hand is rather simple, and should make sense (I = ego = conscious = self-aware = personal world = inner world) ... it appears to me that in your reasoning you appear to put many things sort of upside down. Patti, I have describe that Hutchinson describes the ulnar side of the hand as the 'outer side' and she describes it in terms of the outside world. How much more evidence do you need? Your example regarding page 67-68 here only relates to variations of the thumb... not the fundamentals of the thumb itself. And sorry, your example regarding page 66 is not usefull either... because anatomically speaking the thumb is actually located at the inner side of the body, so one could even argue here that the other fingers start gripping towards the outer world first... before the thumb can proof it's role as a supportive 'gripping' digit - but the thumb itself can not grip much because it only has 2 phalanges... so regarding the gripping the thumb really needs other parts of the hand to create it's function as the 'opposing thumb'! And the thumb is said to represent our 'brains' our intelligence, and long ago palmists even claimed that there is a 'thumb center' in our brains. The essence of human kind is found in it's inner world: our ability to recognize ourselves as an individual being, the 'self', and our ability to think + understand things and other living beings... this is where our power over nature has actually started. That is why our thumb has to represents our human essence... which is inside us: the highest of our needs are psychological of nature: the need for self-actualization & the need for a purpose. And the thumb represents the aspect of self-mastery in order to overwin our animal-like nature and to realize our individual (inner) potential ... and thus from a philosophical and psychological point of view it perfectly makes sense to describe the thumb to represent our 'inner' essence! No, I have only refered to the words that Dukes has used. But 'public' and 'external sources' by principle directly relate to the 'outer world'... and 'private' and 'internal experience' are more related to the 'inner world'. And thus I think I have sufficiently explained why Dukes is included in my list (featured with a reference to the work of Johnny Fincham for confrimation). Well Lynn, if you read it like that... then I wonder why you experience so much trouble to recognize that the ulnar fingers are more 'public' of nature??? The thumb is at the side of the more 'private' fingers. I think the essence of an individual is found inside us (the I + our potential in terms of IQ, EQ, spiritual identity, etc.). And thus the thumb represents our core 'inner' essence... simples! PS. Did you miss my invitation for you to explain if you perceive any fundamental differences between the works of Dukes & Fincham... ?